Nau mai, haere mai, haere mai, haere mai ki o taatou ipurangi o Te Rawhiti Marae. 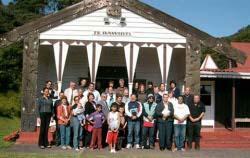 Welcome to Te Rawhiti Marae Online. The Te Rawhiti Marae community needed a place to promote Projects that we are involved in and the marae’s availability for Bookings. Here you’ll also find out about our Fundraising we’re doing to our marae developments.